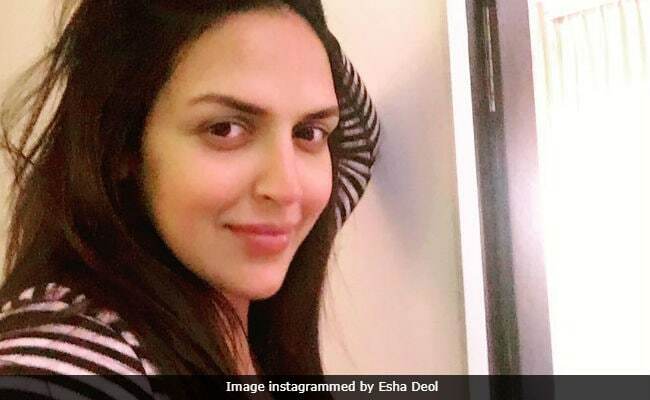 Esha Deol said: "In mommy mode and loving every bit of it"
Actress Esha Deol welcomed her daughter Radhya in October and the actress shared her first selfie in 'Mommy mode' on her birthday today. "In mommy mode and loving every bit of it. Looking forward to this new year, New beginnings," Esha captioned the picture, in which she held back her hair with one hand while talking the selfie. Esha apparently took the picture outside the baby's room as a faint outline of the baby's crib is visible. Fans of the actress requested her to share pictures of little Radhya in the comments section. Some wished the actress birthday and showered best wished for the baby. In mommy mode & loving every bit of it ... looking forward to this new year..New beginnings!!! Esha Deol is married to businessman Bharat Takhtani and the couple welcomed their first child on October 20. Esha and Bharat named their daughter Radhya, a synonym of Radha. Aanouncing Radhya's arrival, grandmother Hema Malini had tweeted: "My cup of happiness is full." Esha Deol enjoyed her pregnancy days to the fullest with a babymoon in Greece and several dinners with family and friends to boot. Two baby showers were hosted for Esha and her then unborn child. The first was in traditional Sindhi ceremony, in which Esha and Bharat took four pheras as per tradition. The second baby shower was a fun-filled event organized by her sister Ahaana. Esha Deol is the elder daughter of Dharmendra and Hema Malini. Her sister Ahana is married to Vaibhav Vohra. Actors Sunny and Bobby Deol are Esha's half siblings, born to Dharmendra and Parkash Kaur. They also have two daughters Vijeeta and Ajeeta Kaur. Esha Deol has featured in films like Dhoom, Koi Mere Dil Se Pooche, Darling and No Entry.